To the end user working with databases distributed through out a company's network is not different than working with multiple tables within a single database. The fact that the different databases exist in other locations should be totally transparent to the user. For this lab we are going to take on the roll of a database administrator in a company that has three regional offices in the country. You work in the central regional office, but there is also a West Coast Region located in Seattle and an East Coast Region located in Miami. Your roll is to gather report information from the other two regions. To record your work for this lab use the LAB3_Report.doc found in Doc Sharing. 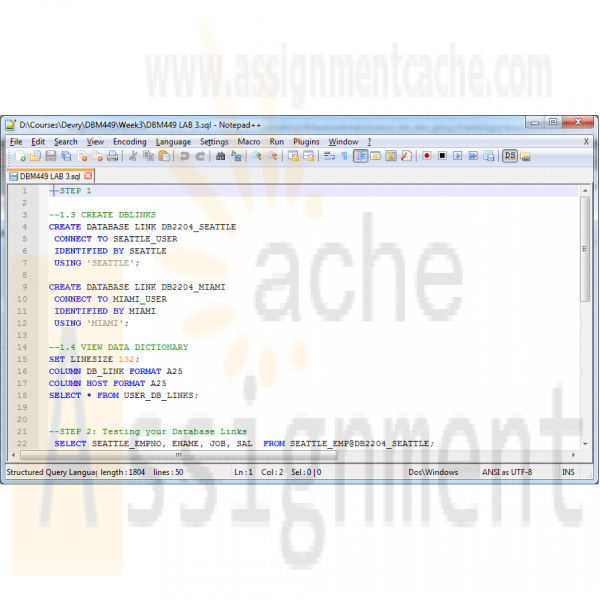 As in your previous labs you will need to copy/paste your SQL statements and results from SQL*Plus into this document. This will be the main document you submit to the Drop Box for Week 3. 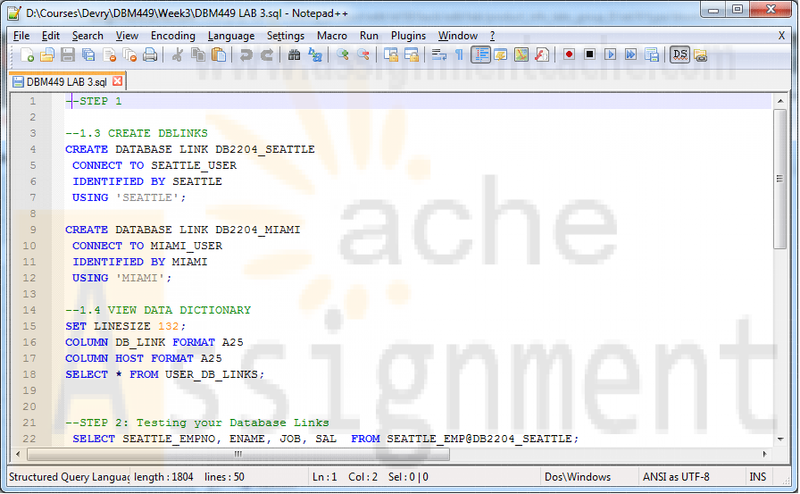 Be sure you are connected to the DBM449_USER schema that was created in lab 1. To begin this lab you will need to download the LAB3_DEPTS.SQL script file associated with the link and run the script in your DBM449_USER schema of your database instance. This script contains a single table and that you will be using to help pull data from each of the other two database instances. Notice that the DEPTNO column in this table is the PRIMARY KEY column and can be used to reference or link to the DEPTNO column in the other two database employee tables. Now you need to create a couple of private database links that will allow you to connect to your other two regional databases. To accomplish this use the connection information listed above in the Lab Overview section. Name your links using your database instance name together with the region name as the name for the link. Separate the two with an underscore (example - DB1000_SEATTLE). After creating both of your database links, query the USER_DB_LINKS view in the data dictionary to retrieve information about your database links. The output from your query should look similar to what you see below. You will need to set your linesize to 132 and format the DB_LINK and HOST columns to be only 25 bytes wide to get the same format that you see. Each of your remote databases has an employee data table. The tables are named SEATTLE_EMP and MIAMI_EMP respective to the database they are in. Using the appropriate database link, query each of the two tables to retrieve the employee number, name, job function, and salary. (HINT: you can issue a DESC command on each of the distributed tables to find out the actual column names just like you would for a table in your own instance. Write a query that will retrieve all employees from the Seattle region who are salespeople working in the marketing department. Show the employee number, name, job function, salary, and department name (HINT: The department name is in the DEPT table) in the result set. Write a query that will retrieve all employees from the Miami region who work in the accounting department. Show the employee number, name, job function, salary, and department name (HINT: The department name is in the DEPT table) in the results set. Now we need to increase our report. Write a query that will retrieve employees from both the Seattle and Miami regions who work in sales. Show the employee number, employee name, job function, salary and location name in the result set (HINT: The location name is in the DEPT table). Writing queries like the ones above can be fairly cumbersome. It would be much better to be able to pull this type of data as though it was coming from a single table, and in fact this can be done by creating a view. Using the query written above as a guide, write and execute the SQL statement that will create a view that will show all employees in both the Seattle and Miami regions (you can use your own naming convention for the view name). Show all the employee number, name, job, salary, commission, department number and location name for each employee (HINT: The location name is in the DEPT table). Now write a query that will retrieve all the data from the view just created. Submit your completed Lab 3 Report to the Dropbox. Your report should contain copies of each query and result set outlined in the lab along with the requested explanation of whether or not it satisfied the business requirement outlined for that particular section of the lab.